GREEN BAY — Packers QB Aaron Rodgers was named the league’s MVP by the Pro Football Writers of America (PFWA) on Wednesday, the first league MVP award announced for the 2014 season. Rodgers finished the regular season with 341 completions in 520 attempts for 4,381 yards with 38 touchdowns and just five interceptions for a 112.2 passer rating. He had the fewest interceptions in the league while ranking second in passer rating and third in TD passes. He led the Packers to a 12-4 regular-season record as Green Bay captured its fourth straight NFC North title and earned a first-round playoff bye with the No. 2 seed in the NFC. The PFWA award could potentially be a precursor to the Associated Press NFL MVP award, recognized as the league’s official award, which Rodgers won in 2011. It will be announced during the annual NFL Honors show on Jan. 31, the night before Super Bowl XLIX. 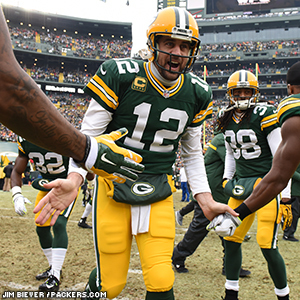 Earlier this week, Rodgers was named to PFWA’s All-NFL team. PFWA also selected Rodgers, WR Jordy Nelson and G Josh Sitton for its All-NFC team, while C Corey Linsley and S Ha Ha Clinton-Dix were named to PFWA’s All-Rookie team. Four Packers in Top 100 so far; how many more? The NFL Network’s Top 100 players series has only 30 players left to reveal. Thus far in the first 70 (100 through 31), four Packers have made the list. Based on those results, it would stand to reason two Packers will be revealed somewhere in the top 30: LB Clay Matthews and QB Aaron Rodgers. It may be tough to predict where Matthews will land. He has been voted to the Pro Bowl each of his first three seasons, but last year’s six sacks were a career low. Yet, he’s the defensive player that opposing offenses game plan around, and this list is voted on by the players themselves. Coming off his MVP season, Rodgers very well could end up No. 1. He set a league record for single-season passer rating at 122.5 last year, and he threw 45 TD passes in just 15 games. He’s at the top of his game, and if he’s not No. 1, he’s going to be pretty darn close. Are there any other Packers you think should have shown up in the Top 100 so far? 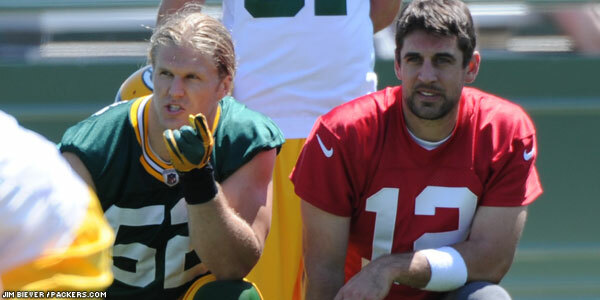 How about predictions for where Matthews and Rodgers are ranked? Tell us what you think. Packers QB Aaron Rodgers has popped up in another promotional video for the Milwaukee Brewers. The spot, dubbed “Glare,” was released on brewers.com today. What do you think? Packers QB Aaron Rodgers has been named Pro Football Weekly’s Most Valuable Player for the 2011 NFL season. He also made the publication’s annual All-NFL Team as the lone quarterback. WR/KR Randall Cobb was honored as the All-Rookie Team kickoff returner. The awards are voted on by Pro Football Weekly, along with the Professional Football Writers of America.